With the arrival of the Curiosity rover on the Red Planet, the long-running saga of the hunt for life on Mars continues. Has there been life on Mars in the past? If so, does it exist there still today? These questions remain open and of keen interest to the astrobiologist. 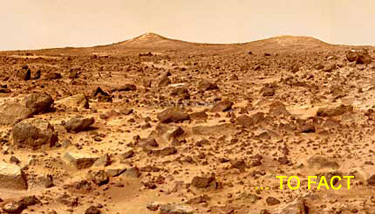 Conditions on the surface of Mars were once much more conducive to the survival of life as we know it (see Mars, past conditions). The average temperature was higher, the atmospheric pressure was greater, and there was plenty of surface water – though exactly how much and how long it remained are important unresolved issues (see Mars, water). Given the ability of hardy microorganisms known as extremophiles to thrive in what appear to us to be very harsh conditions on Earth, the possibility of present-day martian microbes certainly can't be ruled out. Such creatures would most likely have evolved several billion years ago, when Mars was more similar in its climate to Earth, and then perhaps gradually adapted as the environment turned less friendly. In particular, microbial survivors on the Red Planet may have retreated underground where it is warmer, probably wetter, and better shielded from the Sun's harsh ultraviolet rays. The prospects for residual life on Mars appeared to have been raised by the announcement, in 2004, of the discovery by the Mars Express orbiter of trace amounts of methane (see Mars, methane on) and ammonia in the martian atmosphere. The analogy between Mars and the earth is, perhaps, by far the greatest in the whole solar system. The diurnal motion is nearly the same; the obliquity of their respective ecliptics, on which the seasons depend, not very different; of all the superior planets the distance of Mars from the sun is by far the nearest alike to that of the earth ... If, then, we find that the globe we inhabit has its polar regions frozen and covered with mountains of ice and snow, that only partly melt when alternately exposed to the sun, I may well be permitted to surmise that the same causes may probably have the same effect on the globe of Mars ... I have often noticed occasional changes of partial bright belts ... and also once a darkish one, in a pretty high latitude... And these alterations we can hardly ascribe to any other cause than the variable disposition of clouds and vapors floating in the atmosphere of that planet. Shall we recognize in Mars all that makes our own world so well fitted for our wants – land and water, mountain and valley, cloud and sunshine, rain and ice, and snow, rivers and lakes, ocean currents and wind currents, without believing further in the existence of those forms of life without which all of these things would be wasted? ... it is yet to speculate ten thousand times more rashly to assert ... that Mars is a barren waste, either wholly untenanted by living creatures, or inhabited by beings belonging to the lowest orders of animated existence. [T]he present inhabitation of Mars by a race superior to ours is very probable... The considerable variations observed in the network of waterways testify that this planet is the seat of an energetic vitality ... [We] may hope that, because the world of Mars is older than ours, mankind there will be more advanced and wiser. On Mars, the crumbling remains of ancient civilizations may be found, mutely testifying to the one-time glory of a dying world. Indeed, in the very decade that the Space Age began, Willy Ley and Werner von Braun's The Exploration of Mars5 contained a haunting illustration by Chesley Bonestell of the ruins of a Martian temple. That dream, of finding the remnants of a long-dead race, quickly vanished as close-up pictures arrived in 1964 from the first successful Mars probe, Mariner 4, of a crater-strewn wilderness seemly not unlike that of our own Moon. However, in 1971, Mariner 9 brought renewed hope of finding past and even extant biological activity, with its images of what appeared to be dried-up river channels. Such was the revival of optimism that only a few weeks before the first Viking landing, Carl Sagan and Joshua Lederberg went so far as to suggest6 that: "Large organisms, possibly detectable by the Viking lander cameras, are not only possible on Mars; they may be favored." In the event, nothing so spectacular was found, although the Viking results are still open to a variety of interpretations, both chemical and biological. For more on the question of whether Viking found life or not, go here. The Viking 1 and 2 landers are the only spacecraft to date to successfully land experiments on another world that were specifically designed to test for the presence of life. Their results were ambiguous and inconclusive. For more, see Viking's search for life on Mars. NASA's Curiosity rover which successfully landed in Gale Crater on Mars on August 5, 2012, will not search for life directly but carries the most capable package of instruments to date to look and test for signs of habitability – in the other words, the likelihood that Mars could support life, either in the past or still today. The rover is designed to spend at least two Earth-years exploring the ancient crater and an unusual, three-mile high mountain rising from its floor. Called Mount Sharp, this appears to be the remains of sediment that once filled the basin. As Curiosity roves up the sides of Mount Sharp, in the months to come, it will effectively journey through time to see how the environment in this region of Mars has changed over several billion years. 1. Herschel, W., "On the Remarkable Appearances at the Polar Regions of the Planet Mars, the Inclination of its Axis, the Position of its Poles, and its spheroidal Figure; with a few Hints relating to its real Diameter and Atmosphere," Philosophical Transactions of the Royal Society of London, 74, 233 (1784). 2. Procter, Richard. Other Worlds Than Ours. New York: P. F. Collier (1900) (first published 1894). 3. Flammarion, Camille. La planete Mars et ses conditions d'habitabilité. Paris: Gautheir Villars et Fils (1892). 4. Cleator, P. E. Rockets Through Space, p. 195. New York: Simon & Schuster (1936). 5. Ley, Willy, von Braun, Wernher. The Exploration of Mars, New York: Viking (1956). 6. Sagan, C., and Lederberg, J. "The Prospects for Life on Mars: A Pre-Viking Assessment," Icarus, 28, 291 (1976). 7. Sleep, N. H., and Zahnle, K. "Refugia from Asteroid Impacts on Early Mars and the Early Earth," Journal of Geophysical Research, 103, no. E12, 28529 (1998). 8. Goldsmith, Donald. The Hunt for Life on Mars, New York: Penguin Books (1997). 9. Hansson, Anders. Mars and the Development of Life, 2nd ed. New York: John Wiley & Sons (1997).